We lived in Ohio for 5 1/2 years. We have been gone for 2 1/2. CRAZY. I had an awesome group of friends in the great OH. There were lots of girls nights out and girls nights in. There was frequent dinner trips to PF Changs. There were Just Dance dance parties. There was hanging out "just cause we need a break". Our kids played together. Oldest is still betrothed to one of my favorite friend's oldest lovely lady. We will make that happen. Why all the nostalgia? Hey I am prone to be all reflective and sappy. Actually, it happens quite frequently. I think it is due to my increasing in years. Haha! 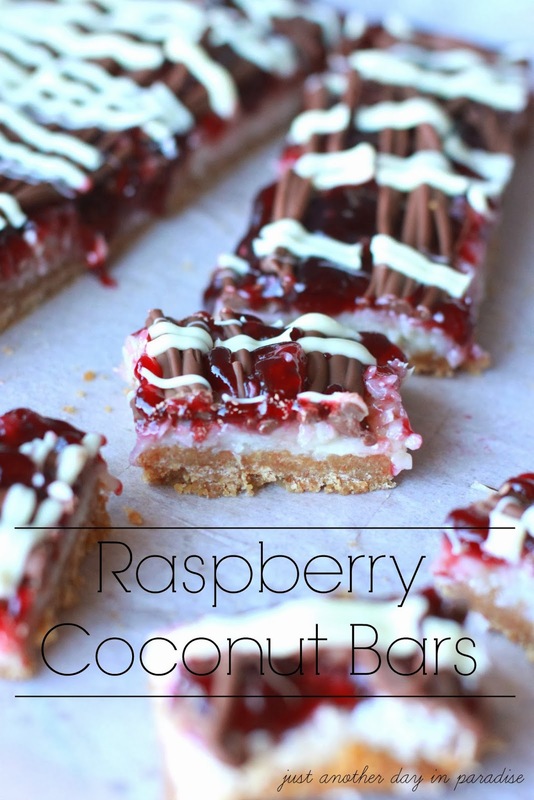 These lovely Raspberry Coconut Bars make me think of Ohio. I first had it at a recipe exchange I had in Ohio. In fact, I think it might have been my very first social thing I ever did in Ohio. These recipe exchanges happened for about a year. We would come and bring a yummy dish and have the recipe available to hand out. Sometimes we had themes. Some of my favorite recipes have come from these recipe exchanges. My friend brought this dessert. I remember really liking it. I grabbed a copy of her recipe and I tucked it away with all my other recipes. I never made it. Until now that is. I do that ALL the time. This recipe made it through my twice a year weeding out process. I just kept skipping over it. I partly blame Pinterest. Since the recipe was on paper and not online, I never saw it. Finally I am done passing it over. 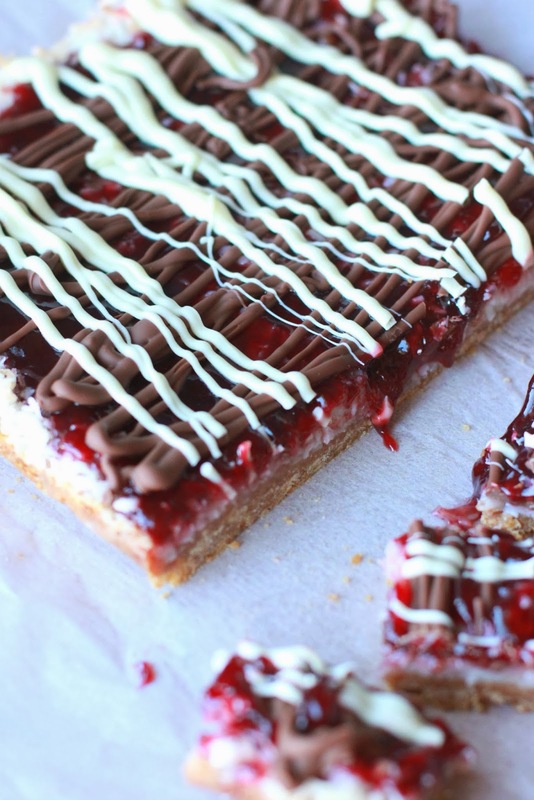 The Raspberry Coconut Bars have been made. 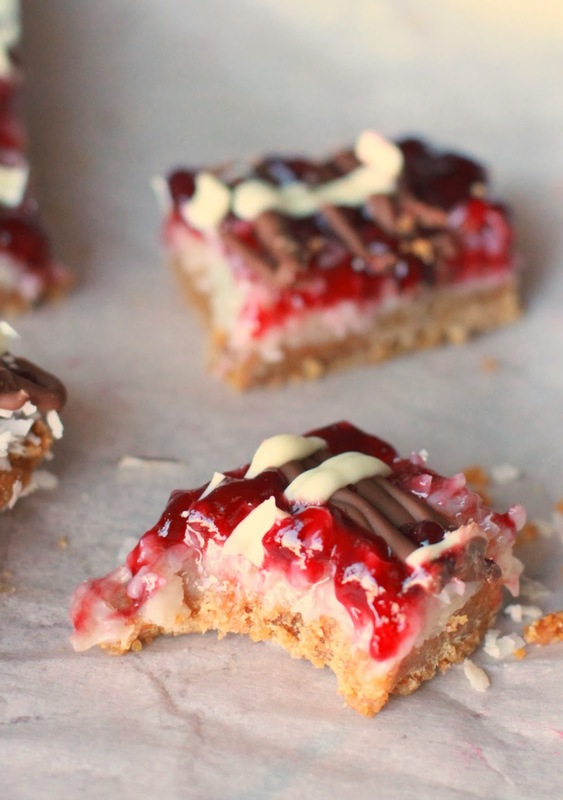 The Raspberry Coconut Bars have been eaten. The Raspberry Coconut Bars have been enjoyed!! Combine the graham cracker crumb, sugar, and melted butter for the crust. Line a 9x13 pan with parchment paper. Spread the crust mixture evenly into the parchment-lined pan. Press the crumbs into the pan until it is compact. Sprinkle the coconut over the crust. Drizzle the sweetened condensed milk evenly over the coconut. Bake for 20-25 minutes, or until lightly browned. Cool slightly. Spread the jam over the bars. Chill for 3-4 hours. Melt the chocolate in small Ziploc bags. This will take just over a minute. Cut a hole in the tip of each bag. Drizzle the chocolate over the top of the chilled bars. Drizzle milk chocolate first in one direction and then white chocolate second in the other direction. Let the chocolate set up a bit. Remove the bars from the pan using the parchment paper. Cut into bars.